The uprising of the Santhals began as a tribal reaction to and despotic British revenue system, usury practices, and the zamindari (feudal) system in India; in the tribal belt of what was then known as the Bengal Presidency. It was a revolt against the oppression of the colonial rule propagated through a distorted revenue system, enforced by the local zamindars, the police and the courts of the legal system set up by the British. Before the British advent in India, Santhals resided in the hilly districts of Manbhum, Barabhum, Chhotanagpur, Palamau, and Birbhum. They lived an agrarian lifestyle, by clearing forest patches, cultivation and hunting for subsistence. But as the agents of the new colonial rule claimed their rights on the lands, the Santhals retreated to the hills of Rajmahal. After a brief period, the British operatives with their native underlings i.e. the local landlords lay claim on this new land as well. Zamindars and the money lenders allured them by goods lent to them on loans, through corrupt practices of the money lenders, the loan grew to prohibitive proportions, for repaying which entire family had to work as bonded labourers. This dispossession turned the Santhals into rebels and finally they took an oath to launch an attack on the ruling authority, i.e. the British. On 30 June 1855, two Santal rebel leaders, Sidhu and Kanhu Murmu, mobilized ten thousand Santhals and declared a rebellion against British colonists. Sidhu Murmu had accumulated about ten thousands Santhal to run parallel government against British rule. The basic purpose was to collect taxes by making his own laws. Soon after the declaration the Santhals took to arms. In many villages the Zamindars, money lenders and their operatives were put to death. The open rebellion caught the British Government by surprise. Initially a small contingent was sent to suppress the rebels but it could not succeed and this further fueled the spirit of the revolt. When the law and order situation was getting out of hand the British Government finally took a major step and sent in large number of troops assisted by the local Zamindars and the Nawab of Murshidabad to quell the Rebellion. British Government had announced an award of Rs. 10,000 to arrest Sidhu and his brother Kanhu Murmu. A number of skirmishes occurred after this which resulted in large number of casualties for the Santhals. The primitive weapons of the Santhals, weren't a match against the musket and cannon firepower of the British. Troop detachments from the 7th Native Infantry Regiment, 40th Native Infantry and others were called into action. Major skirmishes occurred from July 1855 to January 1856, in places like Kahalgaon, Suri, Raghunathpur, and Munkatora. 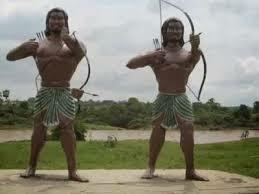 The revolt was brutally crushed, the two celebrated leaders Sidhu and Kanhu were killed. Elephants supplied by the Nawab of Murshidabad were used to demolish Santhal huts and likewise atrocities were committed by the British army and it allies in suppressing the Rebellion. Of the 60,000-odd tribesmen who had been mobilised in the rebellion, over 15,000 were killed, and tens of villages were destroyed. They did get the support of Gwalas (milkmen) and Lohars (blacksmiths). "It was not war; they did not understand yielding. As long as their national drum beat, the whole party would stand, and allow themselves to be shot down. Their arrows often killed our men, and so we had to fire on them as long as they stood. When their drum ceased, they would move off a quarter of a mile; then their drums beat again, and they calmly stood till we came up and poured a few volleys into them. There was not a sappy in the war who did not feel ashamed of himself." "There seems also to be a sentiment of honor among them; for it is said that they use poisoned arrows in hunting, but never against their foes. If this be the case and we hear nothing of the poisoned arrows in the recent conflicts, they are infinitely more respectable than our civilized enemy, the Russians, who would most likely consider such forbearance as foolish, and declare that is not war."